Creamy, crunchy, flavorful and low calorie, this Corn Salad Recipe with Red Pepper and Dill has just about everything you’d want in a salad. You get the sweetness of the corn, the crunch of the bell peppers, and then a bit of crunchy tang from the pickles, all blended perfectly together with mayonnaise. It’s such a delicious and unique corn recipe that makes a great Weight Watchers side dish to go with a huge variety of meals. I adore mayo, but have stayed away from mayo based salad recipes as they can be pretty high in Points. But because the corn is not such a porous vegetable, you don’t have to use as much mayo for the flavor to still come across. So just 1 tbsp of the mayo in this dressing, along with a tbsp of non-fat Greek yogurt worked very nicely. However, if you really love mayonnaise, you can use more of the reduced fat mayo instead of the Greek yogurt, but that will cost you an extra Weight Watchers point per serving. To serious mayo lovers, this may be well worth it. But with or without the extra mayo, this Corn Salad Recipe is amazingly delicious and highly recommended! 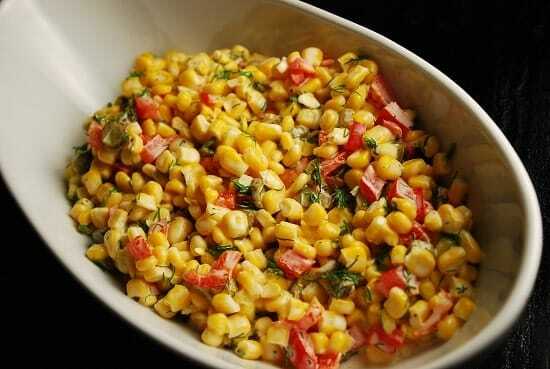 A delicious and easy side dish recipe, this corn salad goes great with so many meals. It’s creamy, flavorful and just 3 Points per serving. Combine all ingredients. Serve immediately.